Hello guys, in this post I am going to talk about visual aids and manipulatives; what they are, and the way we can use them to help our teaching and students’ learning. Fortunately, English teachers are surrounded with all type of visuals which they can take advantage from, the key is to make a correct selection. 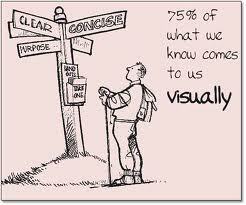 Visual materials are all the objects which are seen by students in order to learn. There is a great variety of visual materials. Visual aids have different use, for example they can help teachers to present a topic, as a part of language practice and when reviewing language that was presented earlier.